Within two years, “Martin and Lewis were the hottest comedy act in show business,” said the Los Angeles Times. 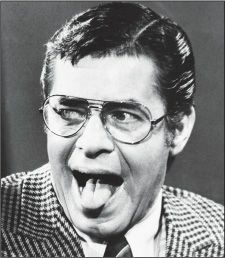 On TV from 1950 to 1955, the pair regularly hosted The Colgate Comedy Hour, and Lewis’ signature lines—“I like it! I like it!” and “La-a-a-dy!”—became national catchphrases. They made 16 films together, from My Friend Irma in 1949 to Hollywood or Bust in 1956. But Martin wearied of playing the stooge; tensions bubbled over and the team dissolved in 1956 after a gig at New York’s Copacabana. Lewis made his starring-directing debut with 1960’s The Bellboy, and enjoyed a string of hits, most notably 1963’s The Nutty Professor—a variation on Dr. Jekyll and Mr. Hyde in which the scientist’s dark alter ego was a smooth lounge singer reminiscent of Martin. “Dismissed by American critics,” Lewis was revered in France, which awarded him the Order of Arts and Letters, the country’s highest cultural honor.